Yesterday was a lovely spring day and I spent it in the garden digging, cleaning up, building things. 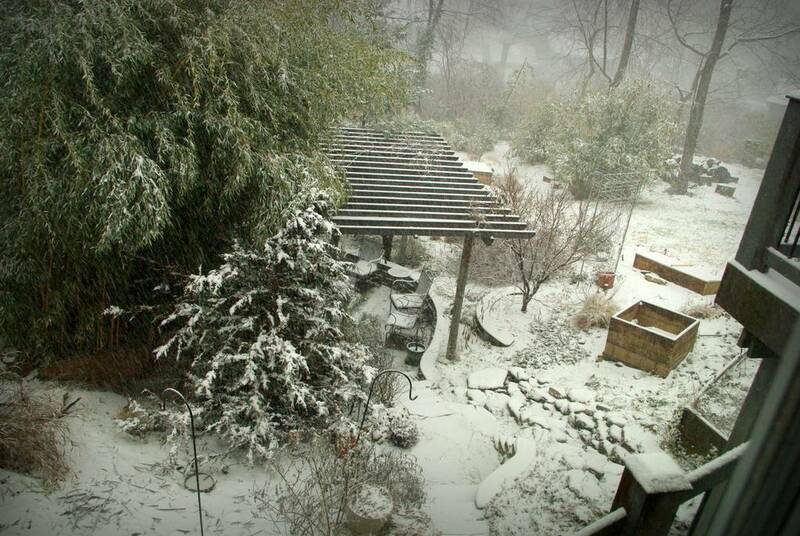 Today though winter returns to St. Louis, as the snow has just started falling. With 5-11" (12-28cm) of snow expected today and tonight, I'm not going to be much more digging anytime soon. That's a lot of snow for St. Louis at any time, let alone the end of March. 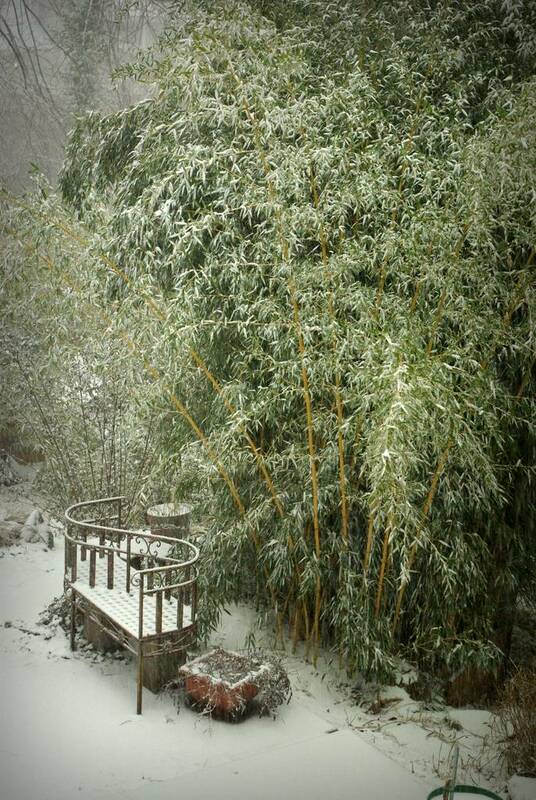 I love seeing bamboo in the snow! Here in Belgium it is still Winter ! 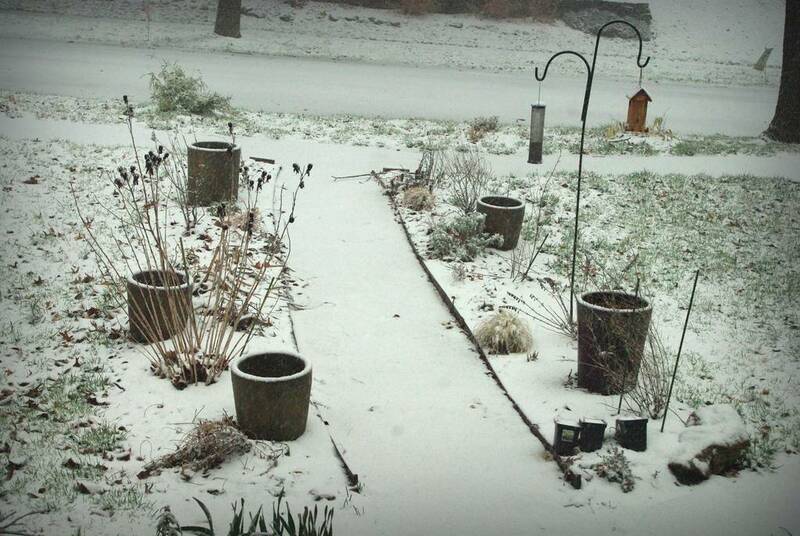 Snow again this morning and No Spring for at least 4 days !!! Spring conditions should arrive maybe in about 2 weeks for us in the NE. So far, March has been much colder than January this year. I'm looking forward to the time it actually rains instead of snows. That last photo is really quite striking. Such a lovely contrast with the yellow canes against the green (and white) backdrop. The conversation seat is gorgeous too. Jenn: Thanks! Is it spring or still winter for you? Yes those are pretty pictures, but not at the end of March! I don't know how you all are coping. Here we've been enjoying a wonderful spring for a few weeks. Today is supposed to be 58 (it has been cool, down to the mid 30's at night) and sunny (dry!). Near Nashville, TN... winter. Calling for snow tonight and all of the trees are bloomed out! :-( Night temps in the 20s. Up to 11" tomorrow eh? Guess my teacher sister will get a day off. Oh, no! I remember those days well. Even in Montreal in May one time. I am grumbling because we will have a frost tonight so have spent the whole day moving stuff again. When the wind drops I have to go out and cover. The sun is shining though! 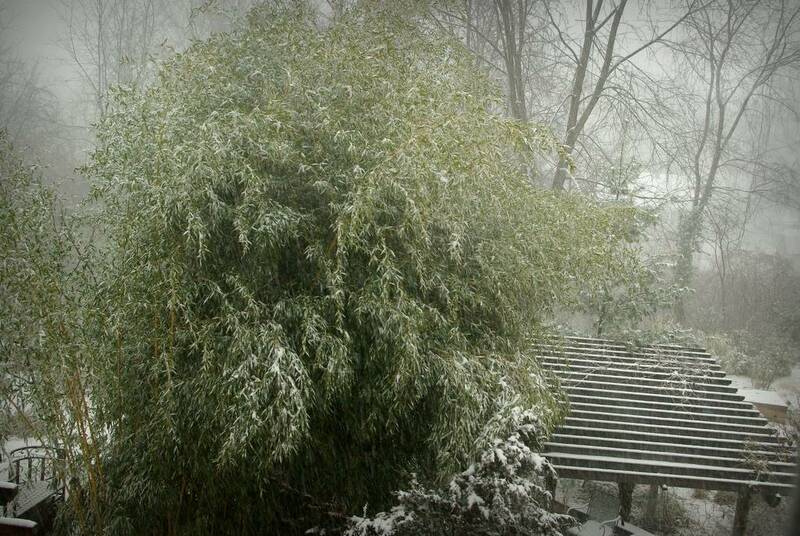 Those are gorgeous photos of bamboo in the snow. They remind me of pictures of China where I expect a Panda to walk out at any moment. Snow here. But I did spot my fish today, so that was a bright spot!